Today is the deadline for California Governor Jerry Brown to sign or reject any bills passed by the legislature this session, so there has been a flurry of activity in the last few days. Here’s a quick look at few freshly signed laws pertinent to sustainable transportation and the climate. We’ve written about A.B. 1785 a few times, and watched it get watered down as it moved through the legislative process. In its final form, the bill by Assemblymember Bill Quirk (D-Hayward) prohibits the operation of any handheld electronic communication device while driving a vehicle. They can be used, however, if they are attached to the dashboard, so distracted driving is not going away any time soon. Mothers Against Drunk Driving was happy that Senator Jerry Hill’s S.B. 1046 was signed. The bill extends a pilot program requiring convicted drunk drivers to install ignition interlock devices if they want to get their drivers licenses back. The bill also lets someone who’s been convicted avoid the punitive license suspension if they install the locks right away. Our culture so strongly believes that driving is a necessity that we fail to imagine how useful it might be for someone to have to forego driving for a while. S.B. 1000 from Senator Connie M. Leyva (D-Chino) is a really solid bill that requires cities to consider environmental justice when updating general plans. Cities have to do so either by adding a new element to their general plans, or incorporating environmental justice into the entire plan. The new law specifically calls for cities to look at which communities are unduly burdened by health risks or pollution, to find ways to promote civil engagement in decision making, and to prioritize the needs of disadvantaged communities. Assemblymember Jimmy Gomez (D-Los Angeles) wrote A.B. 1937 in a similar vein. It requires utilities to pay attention to avoid procuring gas power from plants located in communities “that suffer from cumulative pollution burdens.” Recently released data about the pollution and health burdens borne by disadvantaged communities backs up the need for this bill; it is also a small step in the direction of enforcing existing clean air standards and greenhouse gas reductions required by other recent bills. Another bill, S.B. 1464 by Senator Kevin de León (D-Los Angeles), tackles another side of clean air regulation. The law requires that the investment plan for cap-and-trade look at how its proposed allocations interact with other state regulations and programs, and see whether they can be incorporated into existing programs. It’s a call for efficiency, but also a way to make sure that California’s climate change efforts are all lined up and working together, rather than at odds with each other. Despite the failure of Governor Brown’s own attempt to create more housing, he signed several overlapping bills that will make it easier to build housing. S.B. 1069 by Senator Bob Wieckowski (D-Fremont) and A.B. 2299 from Assemblymember Richard Bloom (D-Santa Monica) both support the building of second units, which they redefine as “accessory dwelling units” (ADUs). Wieckowski’s bill specifically states that ADUs are an important addition to rental housing stock and as such ought to be encouraged. Both bills make it easier to build the units by requiring cities to allow them by right in certain areas, and the bills prohibit requiring a minimum number of parking spaces in certain circumstances—such as near transit or car-share facilities. A similar bill, A.B. 2406 by Assemblymember Tony Thurmond (D-Richmond), does similar things for “junior accessory dwelling units,” built within the existing walls of a house. That bill prohibits any local ordinance from requiring additional parking as a condition to grant a permit, for example. Governor Brown also vetoed a number of bills, including one from Assemblymember Mike Gatto (D-Glendale), A.B. 2586, that would have allowed people to park their cars during street cleaning hours if the sweepers had already passed by. One of his vetoes gives a hint to what might happen if the transportation special session ever gets its everything-but-the-kitchen-sink bill through the legislature. 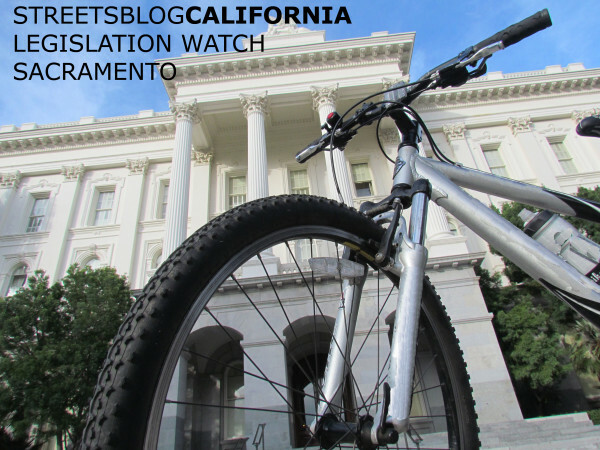 Right now, that bill includes a provision that would remove the California Transportation Commission (CTC) from the purview of the California State Transportation Agency, which currently oversees all state transportation departments. But Brown’s veto message for A.B. 2741 slapped down one idea for shifting authority. That bill, from Assemblymember Rudy Salas Jr. (D-Bakersfield) would have given authority over the state’s long-range transportation planning to the CTC. For social media coverage focused on statewide issues, follow Streetsblog California @streetsblogcal on Twitter, or like our Facebook page here.